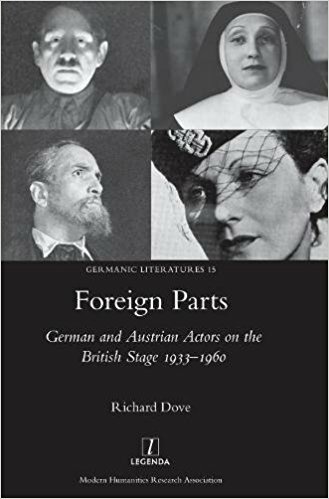 This is a detailed study of five German and Austrian actors who fled Nazism: Lucie Mannheim, Gerhard Hinze, Friedrich Valk and Lilly Kahn, banned from the German stage either for being Communists or Jews, who came to Britain. Dove discusses their roles pre- and post- exile and successfully sheds light on many of the wider issues surrounding becoming a refugee from Nazism. This review will only focus on a few aspects of the many stories Dove recounts. Gerhard Hinze, a member of the KPD, the German Communist Party, was dismissed from the theatre on account of his politics as early as 1932, even before the Nazis took power. He then became involved in performing anti-Nazi plays and cabaret. But in March 1933, the performance was invaded by Nazi storm troopers, leading to a pitched battle on stage. Hinze left Hamburg, and going via Prague, settled for a couple of years in the USSR, where he performed in both film and touring theatre, not always to welcoming Ukrainian audiences. The 1936 show trails did not make for a healthy place for foreigners and Hinze left. Dove tells how he then was refused the right to leave the ship: It was only the late and fortuitous intervention of Labour MP, Ellen Wilkinson, still something of an anti-Nazi activist, who acting as his guarantor, stopped him being returned to Germany. Hinze became deeply involved in setting up and running the Free German League of Culture, with its ‘Little Theatre’ which aimed for refugee audiences, one solution for actors for whom the English language and artistic customs were not English. But like so many of the exiled actors, as soon as Hinze managed to get a toe hold in British theatre, he was interned in 1940 as an ‘enemy alien’, in his case finally sent to Canada (the fate of a disproportionate number of Communist refugees) which interrupted his – and others careers. Once he returned, he succeeded in getting a series of roles. But Hinze stands out for another reason as well: while most of the exiled KPD saw it as their political duty to return to Germany, Hinze stayed put. He surprisingly started to accept comedic roles, though continuing with other parts on stage and screen. Hinze’s desire to appear British is revealed in that, like so many other people, he anglicised his name. One could hardly get more English than Heinz! MI5, naturally, continued to keep an eye on him till 1954. Frierich Valk was a victim of the Nazis because he was a Jew. Although highly successful, he saw the writing on the wall early on and left for Prague in 1932. There he played an important role in cultural anti-Nazi activities, including being an announcer for the German anti-Nazi section of Radio Prague. He escaped just before the Nazi tanks rolled in. Valk then had the advantage of a Czech passport, so was characterised as a ‘friendly alien’ in Britain and succeeded in getting a comedic role in the topical and popular play Thunder Rock during the Blitz. But Valk, like so many others, never entirely mastered the cadences of English speech which left him playing outsider roles. But he did play Churchill, Roosevelt and Stalin for the BBC German Services! It is one of the ironies of this story that German refugees who were categorised as ‘enemy aliens’ and regularly interned worked assiduously for the German section of the BBC! Lilly Kann’s responses to Nazism represent a different path. She accepted a post in the Jewish Kulturband in Berlin, where she spent six years, although aware of the anomaly of a Jewish theatre in a Nazi state. Jewish artists either had to join – or to emigrate. ‘Aryans’ were not allowed to attend. And there were heavy restrictions on what could be produced: no German classics, though foreign classics, suitably censored, were acceptable! She finally left in August 1939. The Austrian actor, Martin Miller, made a remarkable transition to the English stage and was also very successful in a number of British feature films. By the end of the war, he had established himself as an actor of great versatility, which included a role brilliantly satirising Hitler. He too worked for the BBC German Service and acted for them in a number of one-off programmes. Like Hinze, he had no intention of returning. The memories were too bitter: Miller had ‘lost’ too many members of his family. After the war, Miller had a highly successful and varied career on the British stage. Like both Hinze and Kann, he appeared in successful long running plays. There is something poignant that he died when he returned to Austria for the first time to act in a film. Indeed, of the five actors, only Lucie Mannheim returned to Germany but that was far from trouble free. The considerable though varied success of these five actors is both a manifestation of their commitment but also of the support of British colleagues. Some fared better than others. Valk and Kann only achieved episodic roles and success and Dove suggests were at times overlooked because they were too good. Refugee actors were affected by not having an easy sense of the English language and were wont to be typecast. But, besides what they brought to the stage, film and the BBC, they brought with them a sense of European theatre and of ‘foreign’ playwrights which the British theatre of the time was not as cognisant of. We owe them for bringing to British theatre a much needed internationalism. It is important to remember these exiles who were forced into ‘foreign parts’ and then had to take ‘foreign parts’ in a country where they had to struggle to succeed but ended up giving so much.